In 2011, I conducted extensive interviews with three of Ms. Pac-Man's creators for a planned feature about Ms. Pac-Man's creation for the game's then upcoming 30th anniversary. While the subject has since been covered in other venues, I have found that my original interviews are still packed with nuggets of information that have not yet come to light. For this oral history, the participants' responses have been edited for length and clarity and arranged to tell the story. Set in New England rather than the familiar setting of Silicon Valley or Japan, their tale is one of creativity, gumption, and loyalty among a group of gifted friends who happened to work very well together. "How old *ARE* you, The Card Cheat?" "I'm so old I can remember standing in a line, waiting for the chance to play Pac-Man in an arcade." Ms. Pac Man was probably the only game I was obsessed with more than Pac Man and I grew up in the town next to Wayland and had no idea until now of the local history of this game. I even have vague memories of Crazy Otto, which they say was tested in Framingham, which would be my local arcade, Fun & Games. 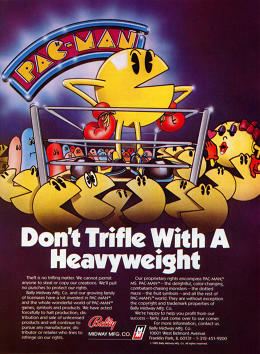 I remember seeing it and thinking "that's just Ms. Pac Man, but not." and now after all these years I finally have an explanation of what it was and why it existed. Thirty-five years later, I am still a fan of even the worst cut scenes in all games because I was so obsessed with getting to the act breaks in this game as a lad after I saw a much older kid get them once. I was going to be snarky about video game nostalgia, about how the games of the 70s/80s still have dominated the public consciousness despite not moving nearly as many units as modern best sellers, but then I looked up how much money Pac-Man made. $1B in quaters in its first year. $1B in hardware sales in first 18 months. Yeah that's a phenomenon. This is great, I never knew that all Ms. Pac-Man machines were mod kits. Great post, great read! I love that it ended up being "Ms.", I always wondered why a female character and why "Ms." The mod kit thing is pretty neat too- every time a Ms. Pac-Man was sold, standard Pac Man was sold too. Makes me wonder if there were cabinets where the Ms. Pac-Man board would get jostled loose and suddenly it only plays Pac-Man? I can't remember if I've seen that before or not. It was more of a fever. Steve Golson also talked about (nearly) all of this in a "Classic Game Postmortem" talk at last year's Game Developer's Conference (GDC). I stumbled across the video a few days ago and thoroughly enjoyed it. Ah yes, Bucker & Garcia. Also famous for "Do the Funky Broadway" and "E.T., I Love You", and by "famous" I mean "yeah, they only had that one song". I think the Ms Pac story is a great example to bring up in the debate over emulation and ownership of ROMs. Yes, a significant majority of games have been abandoned by the authors and/or manufacturers over time. And, until you know for sure (e.g. Jamie Fenton releasing Robby Roto to the world) you don't have the right to decide where that ROM goes. Good on the GCC guys for keeping that contract around and slapping it on Namco at exactly the moment it was needed. Ms. Pac Man and Galaga are my two all-time favorite arcade games. And yet, I think I'd rather not have the combo machine. Galaga as an upright, yes - but Ms. Pac Man always seemed right to me as a cocktail orientation machine. I had a paper route 1979-81 so all my money went into arcade games. '86 - '90 I put in 6,000+ hrs working at the college arcade, as attendant and later back-office accounting guy. That arcade was doing boffo business -- $80,000/mo gross at the cost of 1 person watching over the machines. I was a CS student but it never crossed my mind to get an Amiga 500 or something and author a homebrew game for it. Coulda done well in that arcade. If I ever perfect my time machine, I'll do that, along with inventing Tetris for the Apple II in 1980 and MtG around 1990. And, until you know for sure (e.g. Jamie Fenton releasing Robby Roto to the world) you don't have the right to decide where that ROM goes. Anyway, the notion of property rights as they apply to software are constructed. Nothing like this exists in nature. One might argue that they're constructed for a good reason, and I won't argue with that. But there is really nothing obvious about them, unless you've been taught by your environment so that they appear to be obvious. Ah, just spotted this error! Thirty-five years after its release, Ms. Pac-Man remains both iconic and addictively fun to play. It even makes the news from time to time, as it did in January when computer scientists taught an AI to play the game better than any human, achieving a record-breaking high score of 43,720. Ooh what an error! The article they link to specifically does not mention researchers had devised a way to play Ms. Pac-Man better than humans, it says that it could beat intermediate players but not anyone who had played a significant amount of it. And anyone who's played Ms. Pac-Man knows 43K, while good, is by no means a stellar score. The record broken is only for machine players, it excludes human players. thecjm: "$1B in quaters in its first year. $1B in hardware sales in first 18 months. Yeah that's a phenomenon." Which is more than $2.75B in today's currency.